As you know, we loved living in China, we loved our job and everyone we met was great. 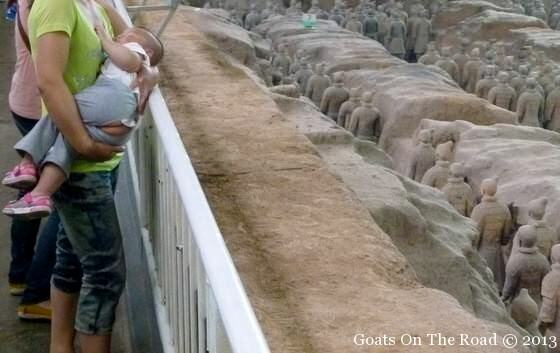 We’re always so incredibly positive about China and rave about how great it is. There are many, many things we miss about living here. However, as with every place, there are some downsides to living in this country. 1. The Air Quality. I’ve never been somewhere with such horrible pollution. Some days we literally couldn’t see out of our window. During different times of the year it can be really good, or really bad. We had a “China cough” almost every day. 2. Smoking. One thing we didn’t know before travelling here was that almost every man in China smokes. Even though there are “no smoking” signs on trains, in restaurants and other areas, it doesn’t matter, they still light up. And of course, no one complains. 3. Peeing On The Street. This one we’ll never get used to. Children have a slit cut out of their pants for easier access to going to the bathroom (a number one or a number two). The only thing is, they just go on the streets, into garbage cans, in supermarkets, in train stations…where ever. Even if a bathroom is just a couple of steps away. 4. The Spitting & Farmer’s Blowing. We now understand the need for clearing of mucus out of one’s lungs. But that doesn’t mean we enjoy hearing and seeing it. Nor do we enjoy a farmer’s blow, get some tissue! 5. The Driving. 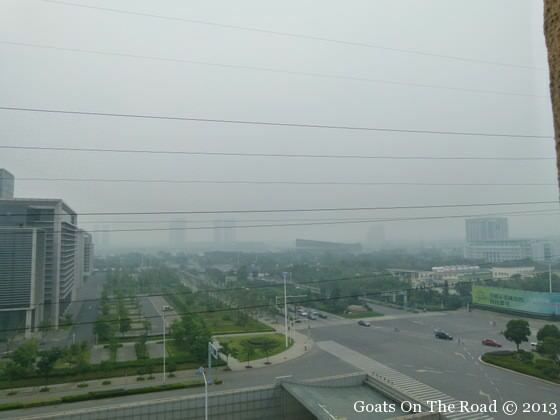 The driving in China is horrendous. We’ve been to many countries and seen some pretty bad drivers, but I think they’re the worst here! No one shoulder checks, pedestrians don’t have the right-of-way, they speed and swerve all over the street and then yell at each other when there’s an accident – when clearly both parties involved were at fault! We’ve seen so many accidents here, it’s insane. 6. Our Bed. Our backs have thanked us since leaving here. No amount of padding could help this board of a bed. The dreaded bed in China! 7. Yelling At Children. Parents and Grandparents scream at their children and smack them all the time, which is something that we personally don’t agree with. 8. MSG & Oily Food. 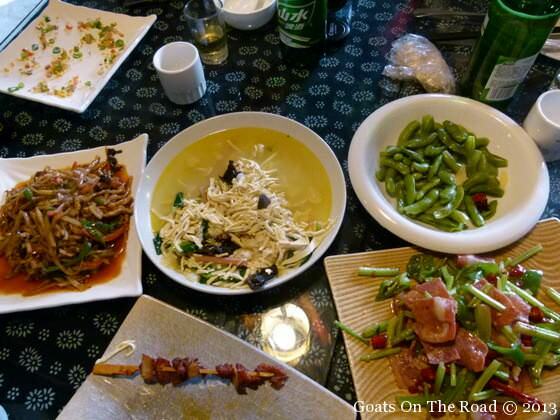 We LOVE the food in China, it’s so delicious and there’s so much variety. However, there are large amounts of MSG used, which adds flavour but the sodium content is so high. The food is also quite oily and usually fried. 9. Their Hatred For The Japanese. 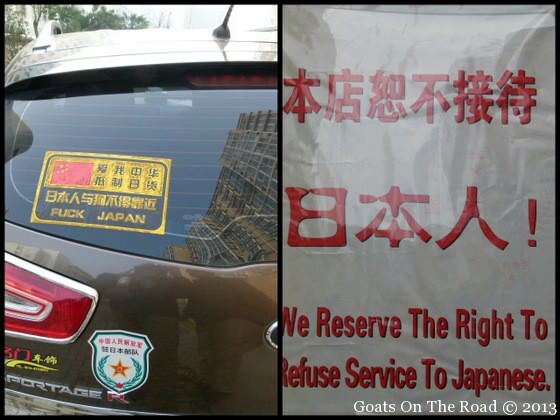 We had no idea how much animosity the Chinese people have for the Japanese. I think it’s more so in our area of China. During WWII the Japanese tortured and murdered many Chinese people in Nanjing, the capital of our province. Our students were always making racist remarks and as non-racist people, it was hard for us to tolerate. 10. Being Too Tall For This Country. Now this isn’t China’s fault, but we are tall people (I’m 5’10” and Nick is 6’0″), so it’s nice to be able to buy clothes that fit us and not have to hunch over to use our kitchen counter and our bicycles! With every country there will be some cons to travelling or living there. For China, we struggled to come up with these ten downsides. There are so many great things about living abroad, and living here in China has been a wonderful experience. One we will cherish and never forget! At first, I found the little slits in kids pants or shorts hilarious…but after a while, you realise it’s kinda horrifying! Oh and the spitting. Just gross. I had no idea aout their hatred of the Japanese, though, but I was only there for a month. Ya, you wouldn’t notice the racism/hatred while travelling there…at least we didn’t. Only when we lived there did we realize that. Either way, we loved our time in China, but thought it was a good idea to let people in on some of the not-so-great things! We often just hear about what ppl love about the places they visit and miss out on hearing what they didn’t like. Glad to read this about China before going there. These are all thins that I would have a hard time, myself. Knowing in advance, at least I can prepare for them. Thanks for the comment Kimmy! You’re right, people usually only write about the positive things (and there are many of those in China), but it’s nice once in a while to get some truthful information about the not-so positive aspects of a country. Enjoy your trip to China, it’s an amazing place! Great post! It helps to think about those things you won’t miss, makes it easier to move on to the next place. And every country has it’s things. It starts out as a unique paradise and then you start to realize otherwise. I knew some of these things, but not the slit in the pants. That’s crazy. You’re right, everywhere has its downsides…everywhere. 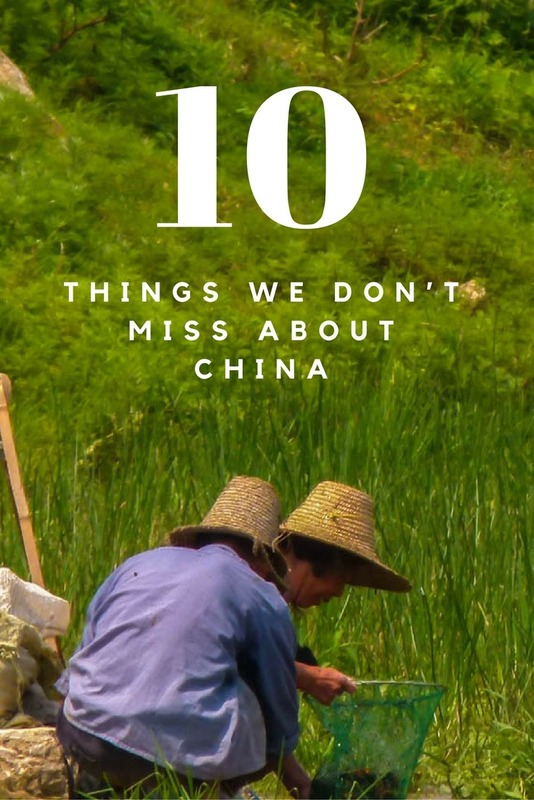 Some people choose not to talk about them, but we figured people travelling or living in China may want to know what we didn’t particularly like about it! I’ve only been living in China for one week and I’ve witnessed every one of the things on your list. I have seen kids peeing in the street, heard old men hocking phlegm, held my breath while men smoked in an elevator, and I currently sleep on a mattress of concrete. That said, I’m completely digging my life in China. Cheers, goats! A lot of this goes on in Hong Kong, but whenever I’ve visited mainland China it’s seemed 1000x worse! It is 1000x worse! For sure. 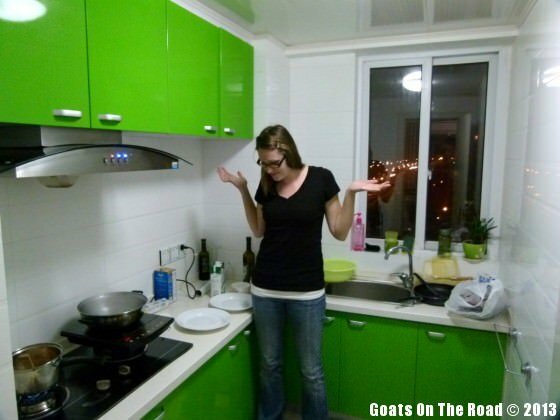 haha, the kitchen was very green (which we ended up loving), but wayyyy too short for us tall wàiguóréns! Your list is funny, honest and totally resonated with me in many ways. I’m Chinese and was born in China, however, after living in Canada for 16 years and returning for a trip recently for over a month, found myself struggling with pretty much everything you listed. One thing I’d like to comment about is the Chinese’s hatred for the Japanese. While I myself don’t agree with racism and discrimination of any kind, there is a historical reason for that. Like you said, the Japanese tortured and murdered a lot of people in China during WWII (and else where in Asia as well); they killed, raped and tortured thousands and thousands of people. Since you lived in Nanjing, I’m sure you know of the massacre that took place there. That said, war crimes are committed by a few and not by an entire nation. Things would not be the way it is now had the Japanese recognized that what they did was not only wrong but inhumane (the way Germans have regarding The Holocaust). They don’t talk about the facts, they gloss over the war crimes they have committed, it’s not taught in their schools. And in recent years, the Japanese government has started paying tribute to Japanese soldier memorials (some of who are known war crime criminals) not just on any other day, but on the anniversary of the massacre of Nanjing. If this was done in Germany, would it not cause negative responses? The Chinese are a proud people, with the Japanese government acting in those ways, there is a reason they are disliked in China. Moreover, those signs that you saw that say “Japanese and dogs are not allowed” Well, there used to be signs like that in Shanghai at the start of WWII when the city was divided and handed over to Western colonialists. I think they see this as “payback”. And finally, because China is still such a homogenous society, unlike countries like the US and Canada, there is still a strong sense of nationalism there. I’m not saying it’s ok to be racist, but simply trying to explain things from the other point of view. I find a lot times, comments about other cultures are often made when they don’t necessarily have the full understanding of where the people of that culture are coming from. I totally agree with every single point!